Working with Fred was an absolute pleasure. He was responsive, helpful, and patient throughout. The end product was beautiful and he was always professional. Fred has my absolutely highest recommendation. 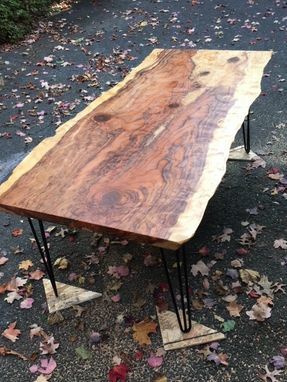 6 ft long, live-edge redwood slab with steel hairpin legs. Top is natural color (not stained), finished with satin varnish. Base is four steel hairpin legs in satin black. Every maker has a story. Be a part of Fredric Blum Design's story by placing an order, leaving a review, and seeing your review appear here.